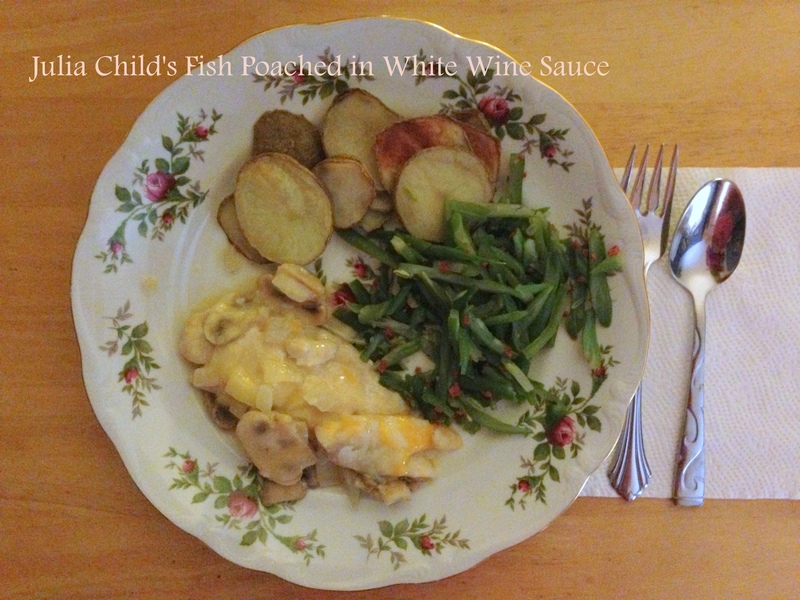 Editor’s note: This blog post is guest-written by my 13-year-old daughter, who was required to cook a French dish for her French class! I am using her project report as the text for the blog. She did a great job. 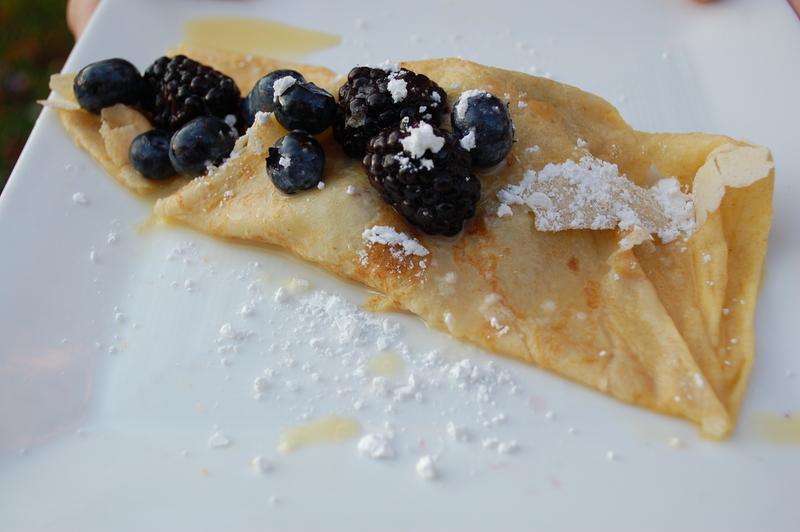 We chose to make berry-stuffed crepes with creme anglaise, which is a light, custard-based pouring sauce used mainly with dessert dishes. This recipe makes 2 cups of the creme anglaise, so there are plenty of leftovers-try it on pancakes and waffles, french toast, or pound cake. You can serve it hot or cold. One note about the reference to the pan-I do not have a crepe pan. We tried using a griddle, but we switched to a non-stick skillet with rounded edges, which heated the batter more evenly, to my surprise. Enjoy! I really enjoyed this project because it was different. You don’t cook for a grade very often, so this was enjoyable. We did not have to go shopping; as I picked a recipe that I already had the ingredients for, which was convenient. I used a kitchen-aid mixer as opposed to something else, like a whisk, which saved a lot of time. The crème anglaise took a bit of patience because you had to continuously stir it while it thickened for a long period of time, but it was worth the wait. 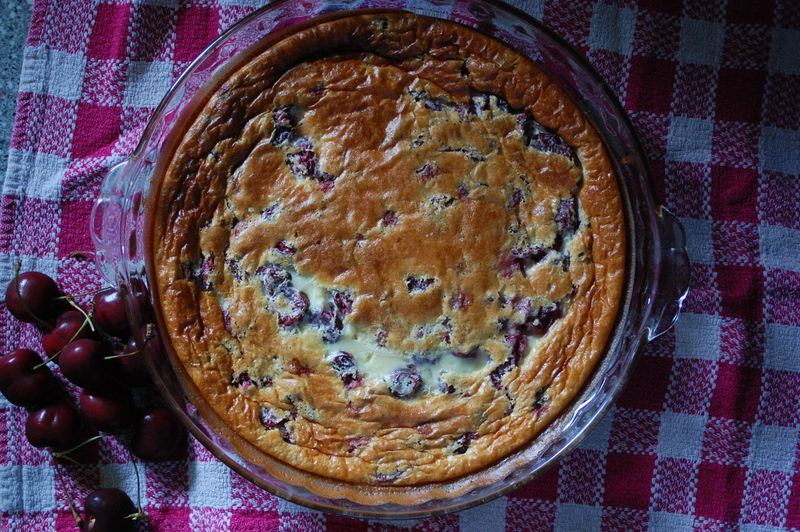 It did not thicken as much as I had hoped, but it was still delicious with the berry crepes. 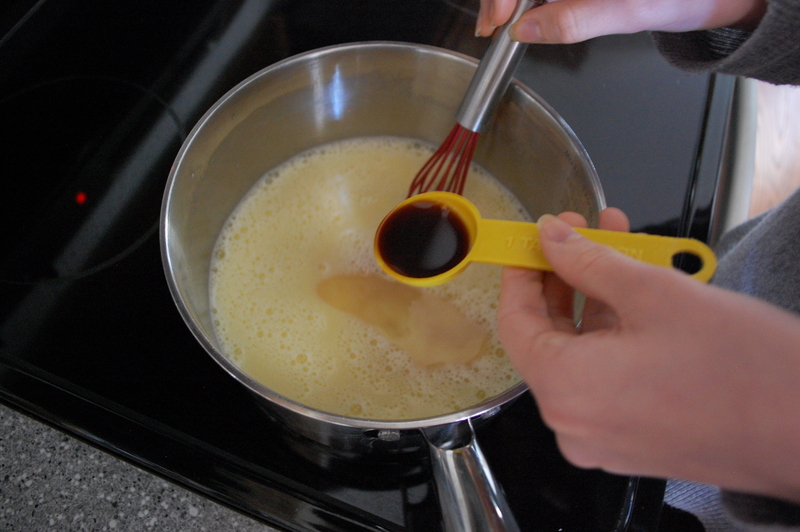 The crepe batter we used was flavored with brandy and vanilla, so it was good even plain or with a little sugar. I did end up making a pretty big mess, but that’s half the fun, right? My favorite part of this project was definitely eating it, and my least favorite part was probably trying to make the first few crepes. The pan I had wasn’t working very well, and the batter kept going on too thick and would not cook all the way through. I made a mess, but made some good ones eventually. 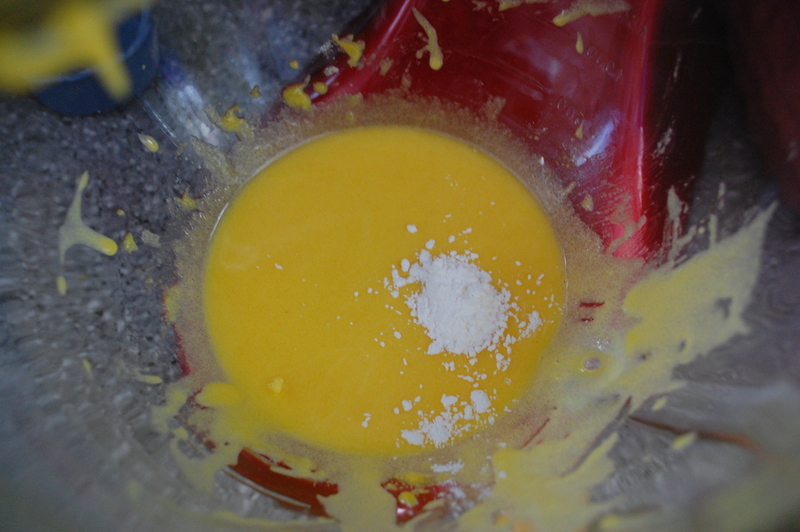 To make the creme anglaise, place the egg yolks and sugar into a mixing bowl and combine, beating for 2 to three minutes, until the mixture is pale yellow and forms a ribbon. Beat in the cornstarch. 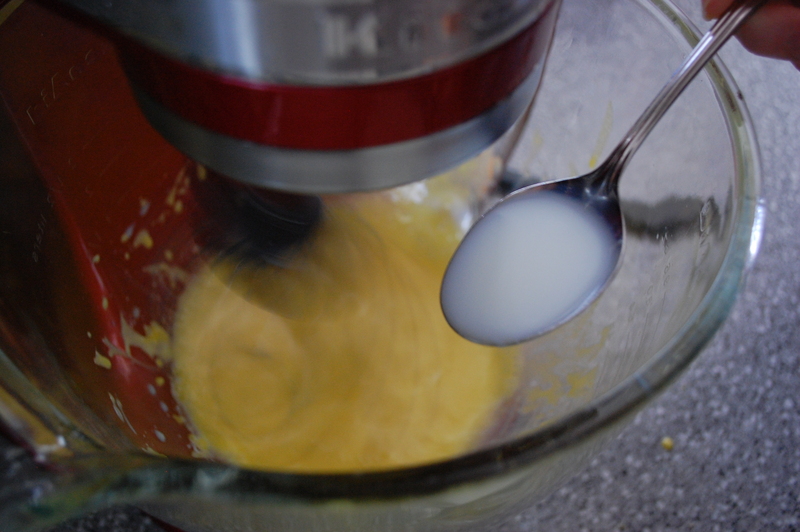 Keeping the mixer running, gradually add the boiling milk in a thin stream of droplets to allow the yolks to slowly warm. If you add the milk too quickly, the eggs will cook and you’ll be finished! We used a spoon and dripped the milk into the yolk mixture, one spoon at a time. We added the milk one spoon at a time to keep from heating the eggs too rapidly. When all the milk has been added, pour the mixture into a heavy saucepan and set over moderate heat, stirring lowly and continuously with a wooden spoon and reaching all over the bottom and sides of the pan, until the sauce thickens just enough to coat the spoon. Do not let the custard come anywhere near a simmer. (Max temperature would be 165 on a candy thermometer). Lily pouring the mixture, which was quite foamy, into the saucepan. Stirring it over the heat. Take the sauce off the heat and beat it for a minute or two to cool it. Beat in the vanilla and any optional flavoring you choose. 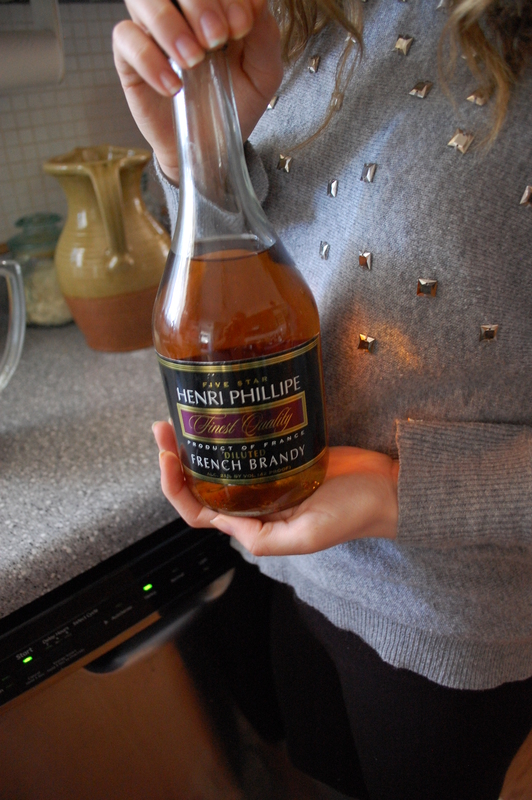 Brandy makes everything taste better! To make the crepes, place all the ingredients listed above, in order, in a blender and blend for 2 minutes until smooth, stopping to scrape down the sides when necessary. 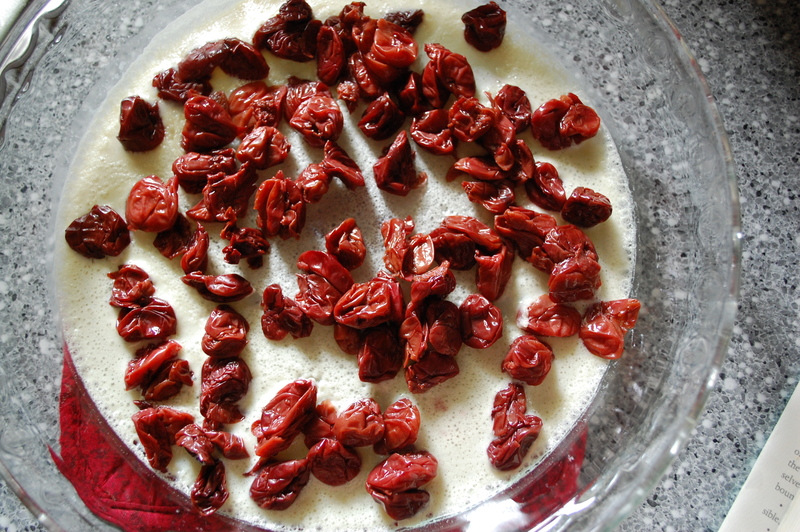 Refrigerate for two hours. Blenders make mixing very easy! 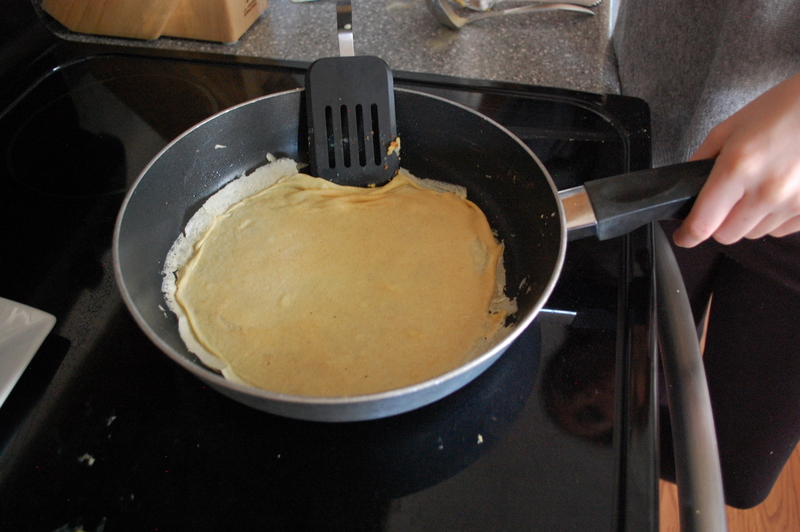 When it’s time to cook the crepes, hit a non-stick skillet pre-treated with cooking spray to medium heat. When you drop a few droplets of cold water on the surface, they should sizzle. Do not let it get to the smoke point! Spoon 2-3 tablespoons (we used a spoon ladle and did one ladle full) onto the pan and immediately begin to tilt the pan in all directions to cover the bottom evenly. Cook about 1 minutes, or until browned on the bottom. 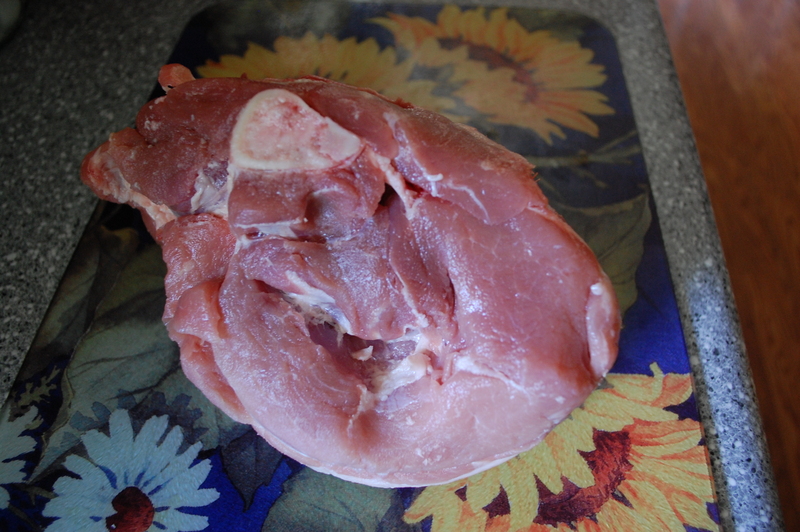 Turn carefully and cook briefly on the other size. Cool on a plate as you continue to make the rest. You can stuff crepes with a variety of things-jam, berries or other fruit, chocolate sauce, marshmallows, caramel, or plain powdered sugar. Drizzle creme anglaise over the top and enjoy! There’s a scene in the movie “Julie and Julia” where Julia and her Mastering the Art of French Cooking co-authors are discussing the task of creating a fool-proof mayonnaise recipe that housewives can duplicate. They’re trying to make it easy, but their angst makes it seem like it must be a difficult recipe to duplicate. Thus, I vowed never to try it. It happened rather simply. I had six egg yolks left after a weekend of baking recipes that contained egg whites. I hate waste. I could feed them to my dog, but that felt like it wasn’t the frugal thing to do. I remembered the mayonnaise recipe. I felt adventurous. I just decided to do it. Nike would be proud. It turns out, making mayonnaise isn’t exactly difficult-it just takes a lot of time. If you don’t have a KitchenAid mixer or a stand mixer, it will also take a lot of muscle power. Fortunately, I have Babs and a book to keep my occupied during the half hour mixing process. Use a medium speed on your mixer while incorporating the oil. 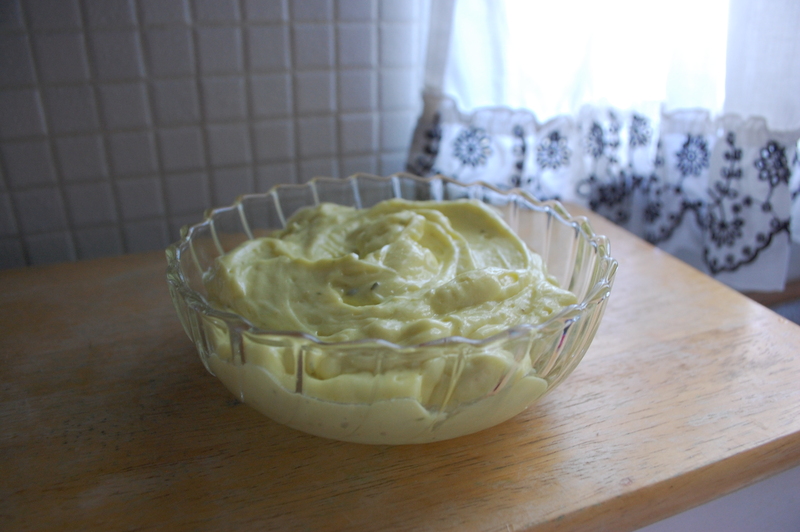 Homemade mayonnaise is SO. MUCH. BETTER. than store-bought mayo. I can hardly believe I waited this long to make it. I’m not a huge mayo fan, but I find I am using it more now that I have my little plastic container of homemade bliss. It’s rich and creamy and doesn’t taste like plastic. If I can do it, you can do it! This recipe comes, of course, from Mastering the Art of French Cooking, published in 1961. It makes about a cup of mayo. I’ve included some videos to help you, as it really is necessary to show the process of incorporating the oil into the yolks. It starts with three egg yolks and a mixer-although I kept thinking about how Julia did the beating of the yolks and the oil by hand… ouch! Julia has some extra tips with her recipe. 1.) 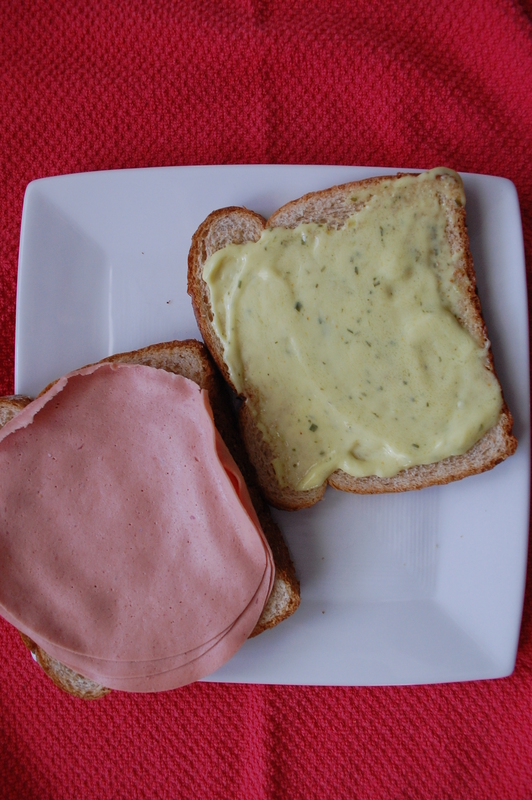 Temperature: Mayonnaise is easiest to make when all ingredients are at normal room temperature. 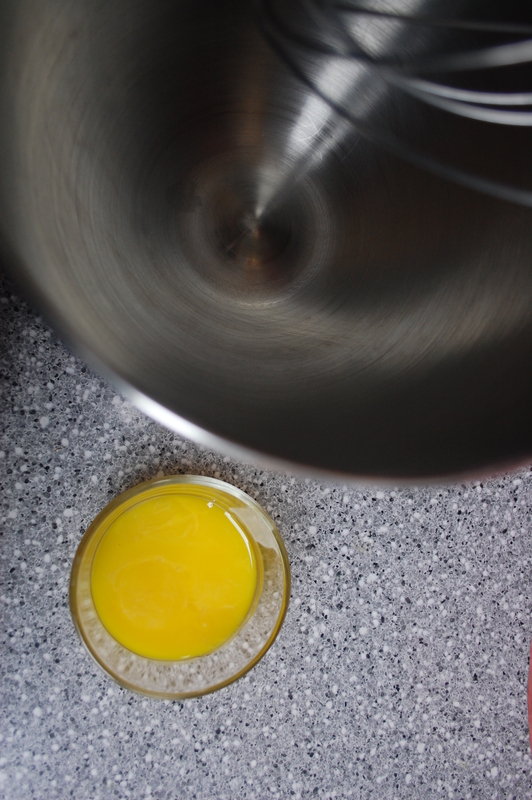 Warm the mixing bowl in hot water to take the chill off the egg yolks. Heat the oil to tepid if it is cold. Make sure your egg yolks are at room temperature. 2.) Egg Yolks: Always beat the egg yolks for a minute or two before adding anything to them. As soon as they are thick and sticky, they are ready to absorb the oil. 3.) 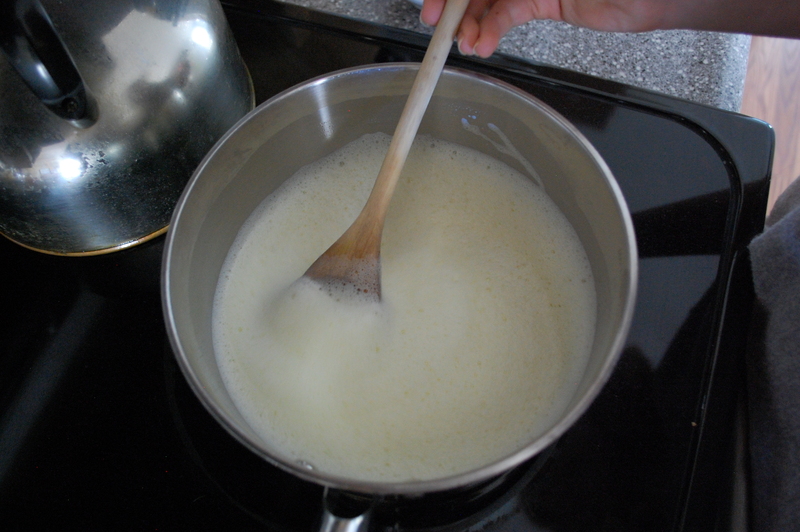 Adding the Oil: The oil must be added very slowly at first, in droplets, until the emulsion process begins and the sauce thickens into a heavy cream. After this, the oil may be incorporated more rapidly. 4.) 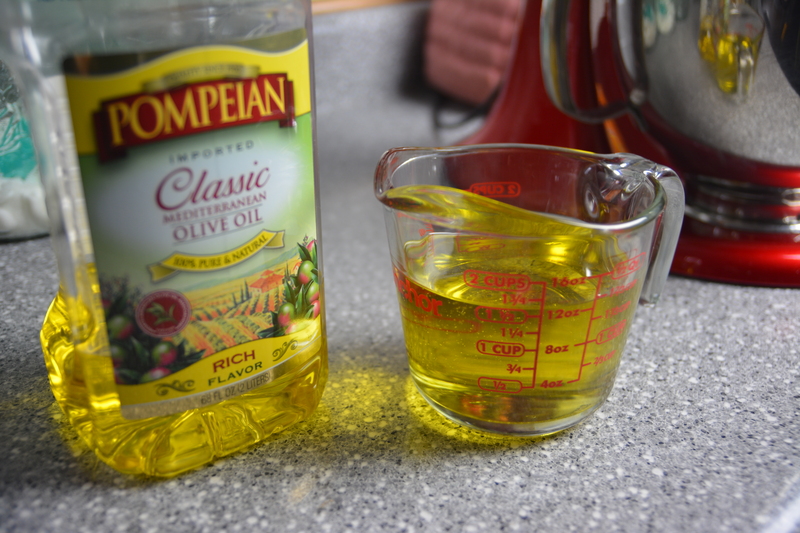 Proportions: The maximum amount of oil one U.S. Large egg yolk will absorb is 6 ounces or 3/4 cup. When this maximum is exceeded, the binding properties of the egg yolks break down, and the sauce thins out or curdles. 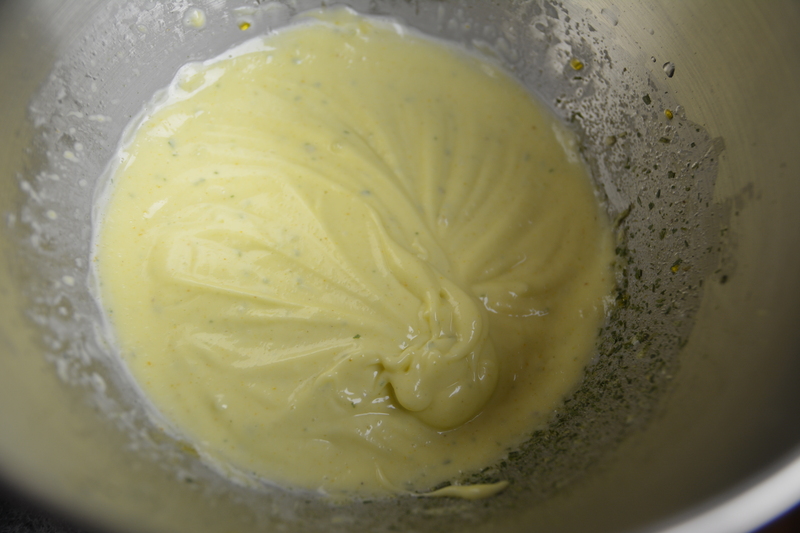 If you have never made made mayonnaise before, it is safest not to exceed 1/2 cup of oil per egg yolk. 5.) 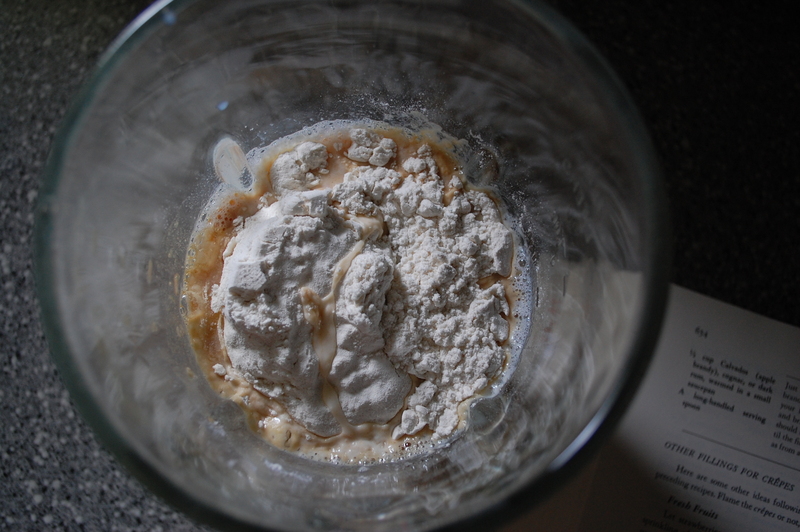 REFRIGERATION: After several days under refrigeration, mayonnaise has a tendency to thin out, especially if it is stirred before it comes to room temperature. 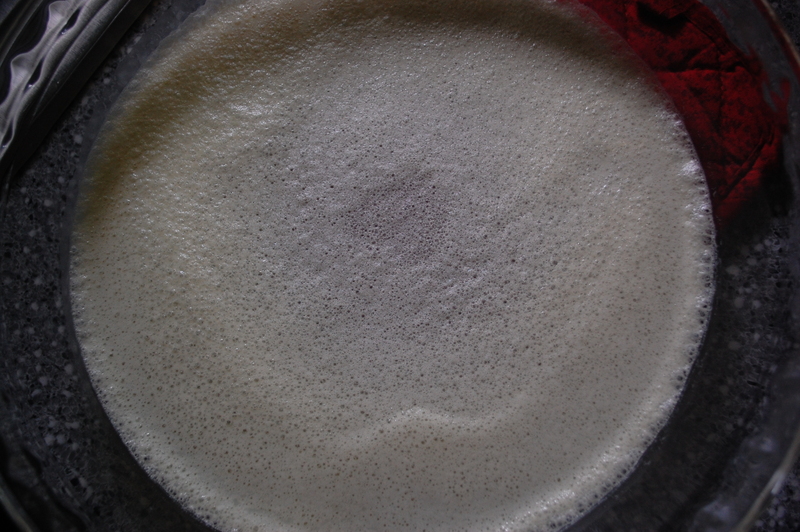 Warm the mixing bowl by running it under warm water. 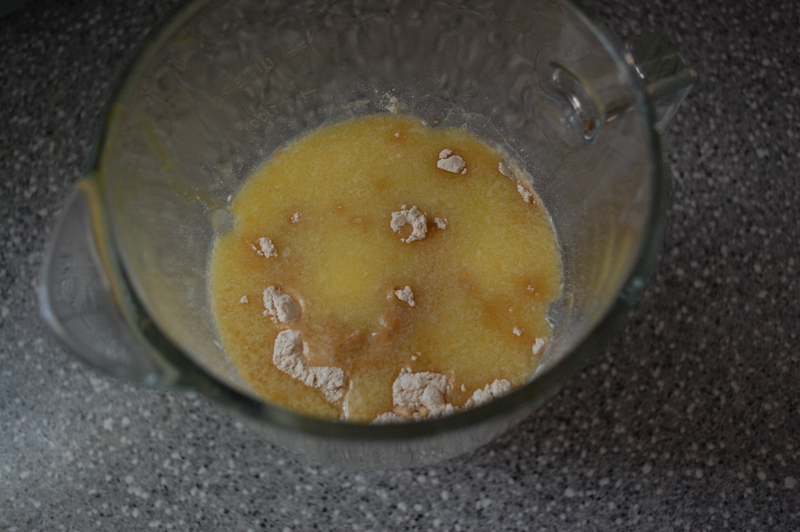 Dry and add egg yolks, beating for 1-2 minutes, until they are thick and sticky. Add 1 tablespoon of the lemon juice, the salt and the mustard. Beat for 30 seconds. The egg yolks are now ready to receive the oil. 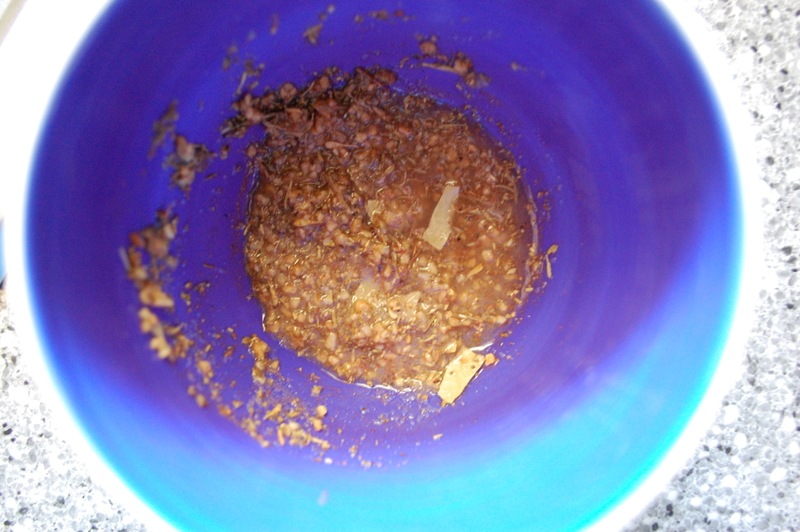 Add it a teaspoon at a time while beating the mixture constantly. Watch the oil and not the sauce. When the egg yolks have absorbed the oil, add another teaspoon-and not before! Keep doing this until you have added 1/3 to 1/2 cup of the oil. At that point, you’ll see the sauce thicken and you can take a deep breath, because the “crisis” point is over. If you are beating the sauce by hand, you can rest for a second. 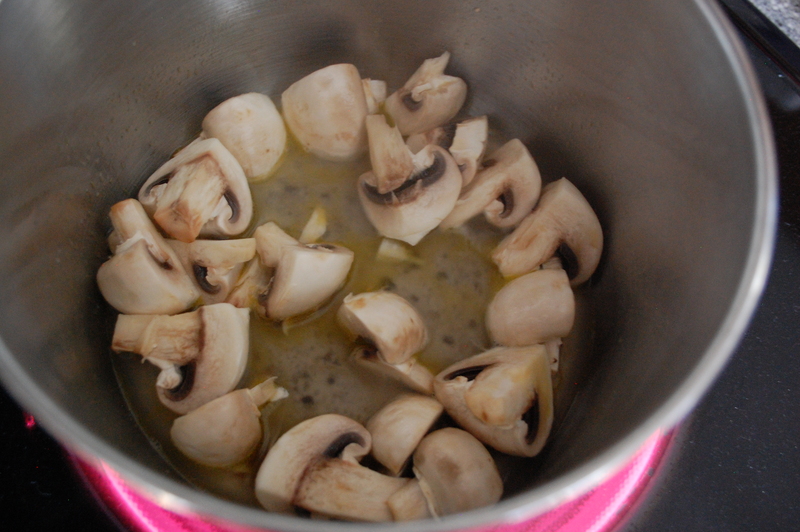 Then keep adding the oil, one to two tablespoons at a time, blending thoroughly after each addition. When you have added all the oil, beat two tablespoons of boiling water into the sauce to keep it from curdling. Season to taste with wine vinegar, lemon juice, salt, pepper, mustard, curry, or any other spice you like. 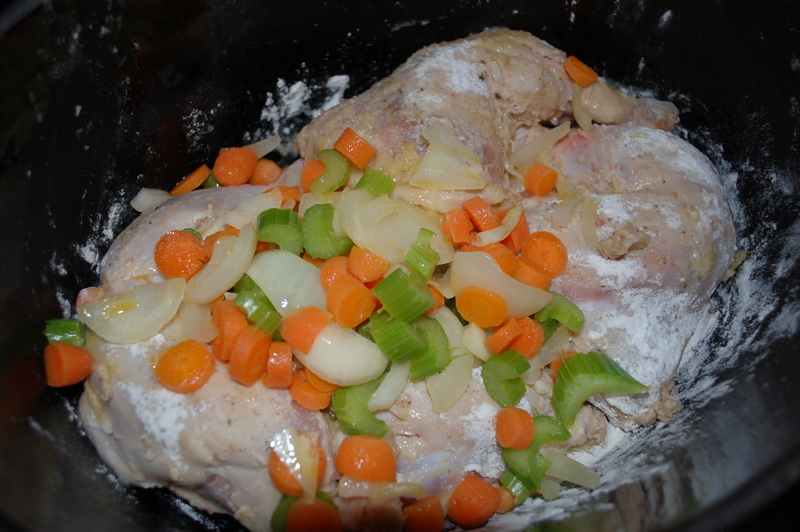 Thickened up and ready for sandwiches! If the sauce is not used immediately, scrape it into a small bowl and cover it closely so a skin will not form on its surface. Keeping up with our theme of easy Julia Child recipes, this lovely entrée is a cinch. 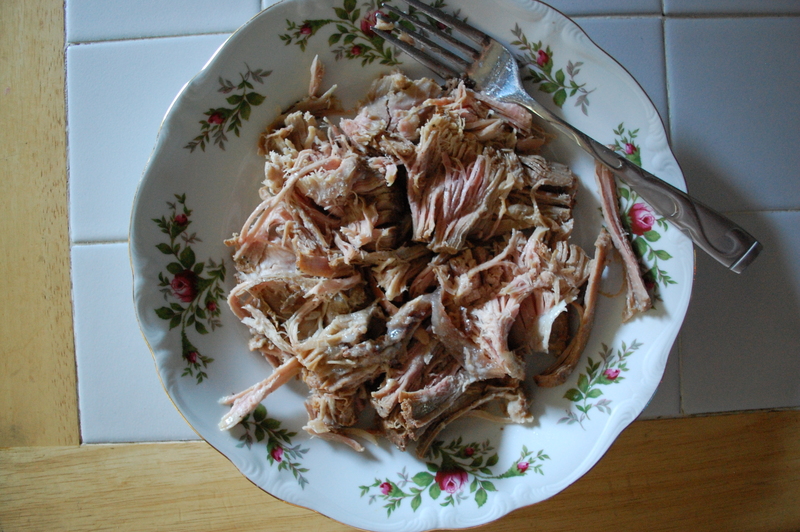 In her book Mastering the Art of French Cooking, Julia details how to cook the pork in a casserole in the oven. But I did this in a crock pot and it turned out fantastic. It’s so easy, it’s almost hard to believe it’s one of her recipes! I think the marinade is the key. Do not skip that step. It’s best to start it as far in advance as possible-I would tell you to go ahead and marinade it two days in advance, flipping it several times a day. The longer it brines, the better the flavor. As long as two days prior to cooking, mix the salt, pepper, thyme or sage, bay leaf, allspice and garlic in a small bowl. 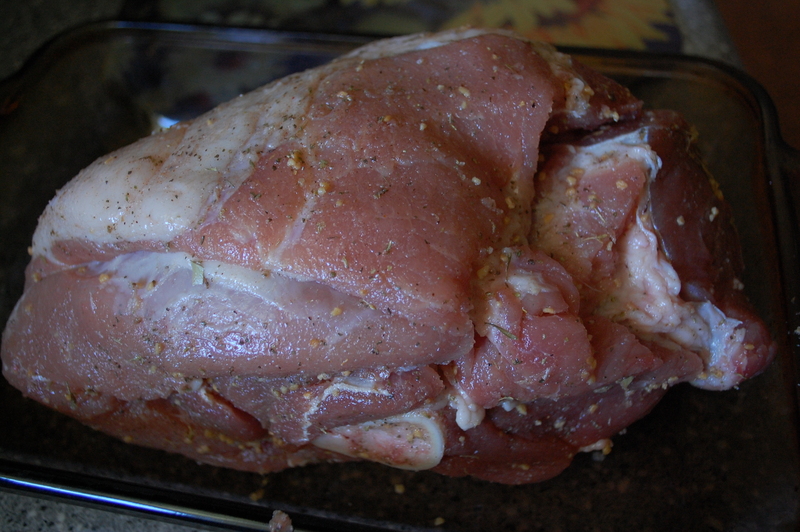 Rub the spices all over the surface of the pork. Place it in a covered bowl in the refrigerator. Turn the meat 2 to three times a day. 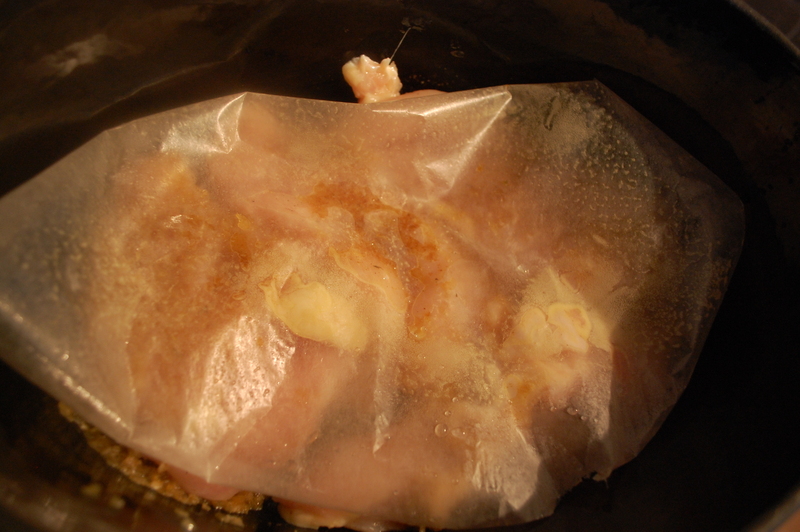 Before cooking, scrape off the marinade and dry the meat thoroughly with paper towels. 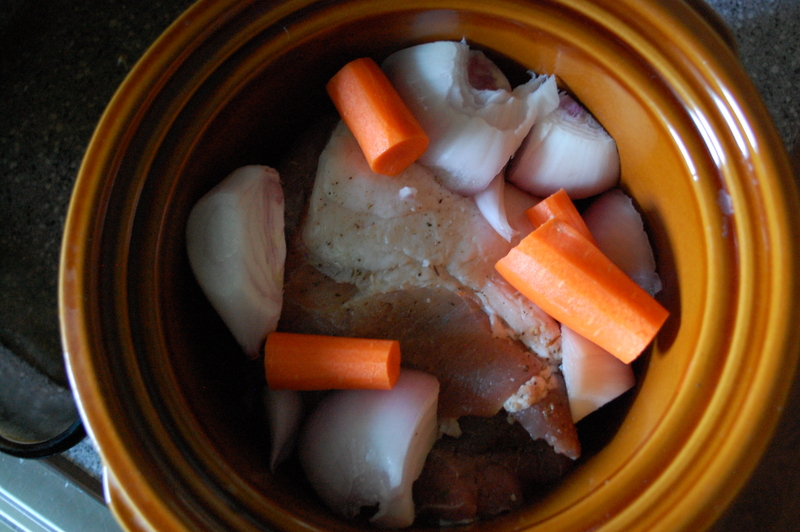 Place the pork, onion, carrot, and liquid into the slow cooker. Cook on low for 6-8 hours until the meat is no longer pink and falls apart. That’s it! Julia recommends using the juices left after cooking to make a gravy. To do this, you simmer the juices slowly for 2-3 minutes, skim off all but a tablespoon of the fat, smash the vegetables and add them to the juices, boil rapidly until it’s reduced to about a cup of liquid, then strain. This recipe needs very little introduction. 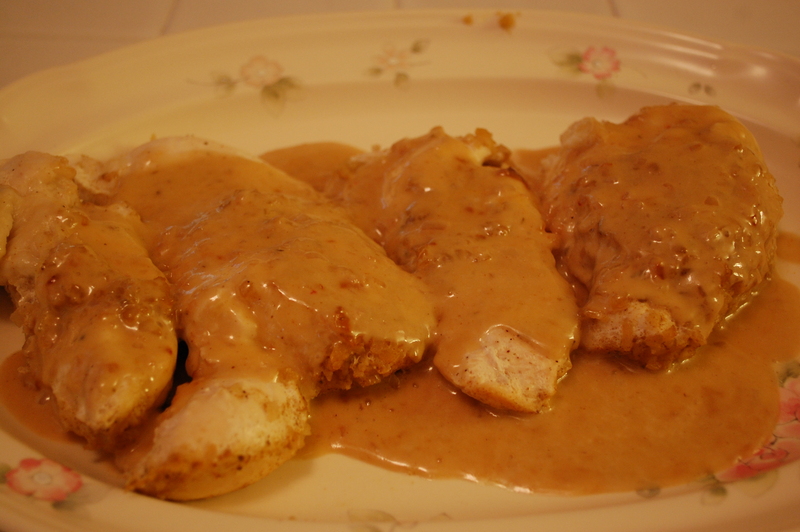 It is a fantastically delicious way to serve chicken! It’s also fancy enough for guests and pretty darn easy to make. You’ll need an fire-proof casserole or a dutch oven that can be used both on the stove and in the oven for this recipe. 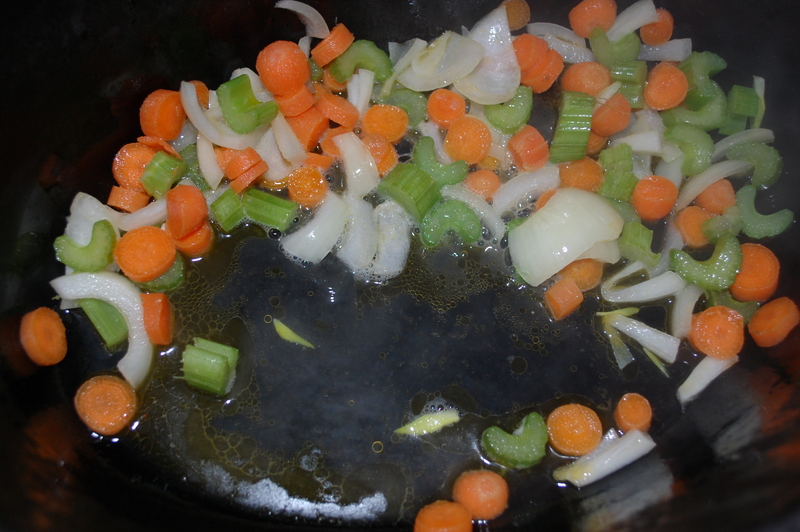 • 1/4 cup beef stock (yep, you read that right-beef stock for chicken). 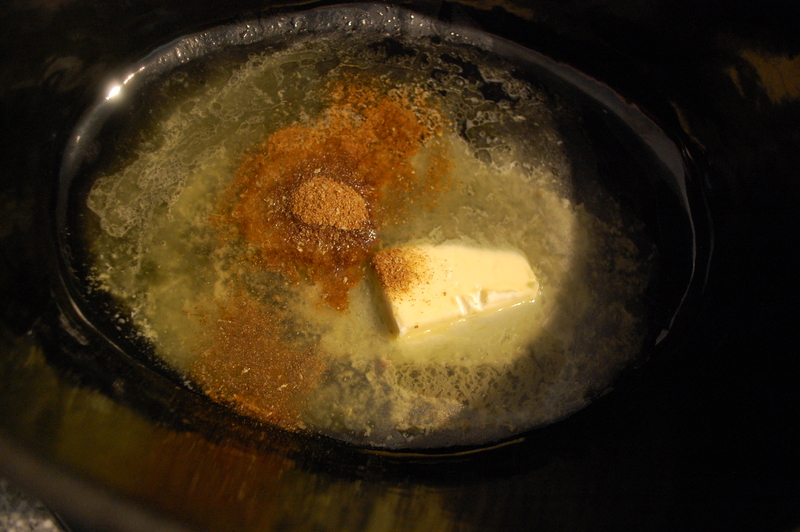 When the butter is ready, add the onions, the 1/8 teaspoon salt and paprika and cover the dutch oven. Cook for 10 minutes until the onions are tender and translucent. Add the chicken, turning it over quickly one time to cover with onions and paprika. Place greased wax paper on top. 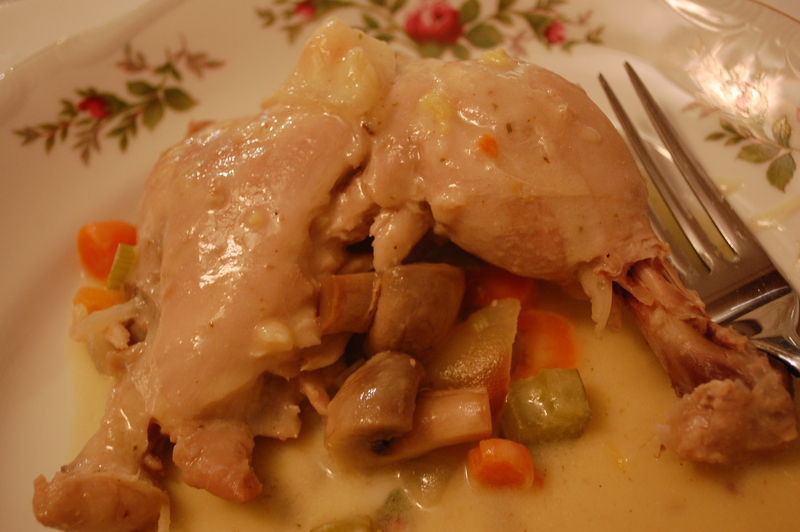 Cover the dutch oven and bake in oven for 20 minutes, or until your chicken is thoroughly cooked. Set aside on a plate covered with paper towels, covered with a lid to keep warm. Pour the stock and wine into the casserole with the cooking butter and boil down quickly over high heat until syrupy (about 8 minutes). 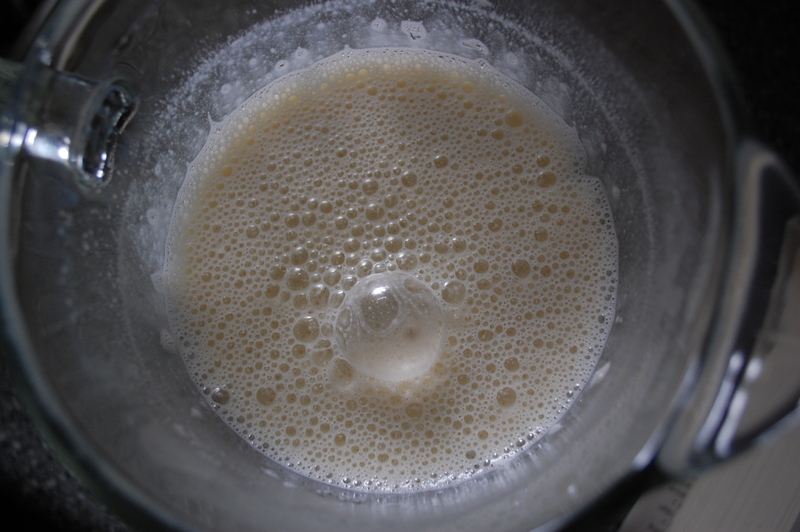 Stir in the cream and boil down again over high heat until cream has thickened slightly. Season off heat if you like. Pour over chicken and serve! For more info or recipes from the PBS Cook for Julia event, click here! 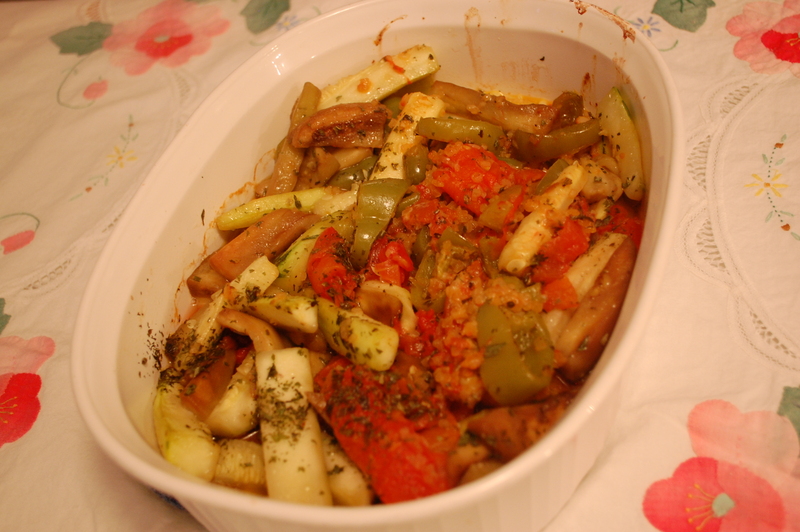 Here’s the extent of what I knew about Ratatouille before attempting this recipe. 3.) There’s a Parisian rat that really knows how to cook it well. Oh wait, that was a movie. 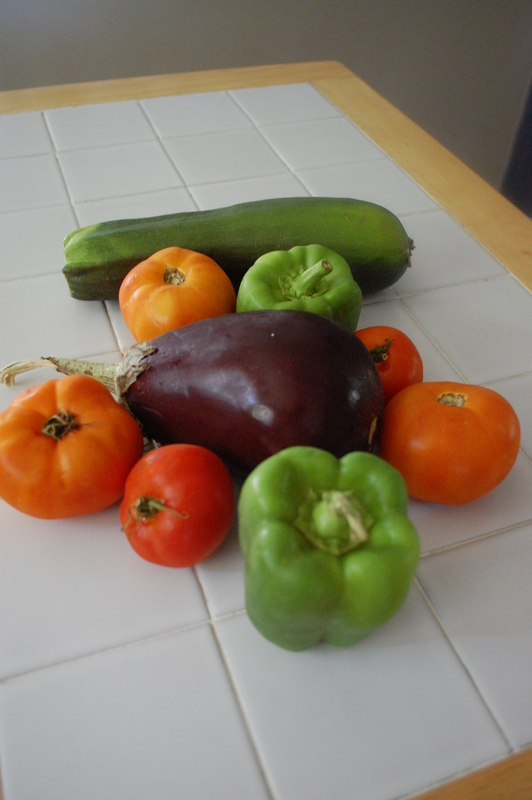 Thanks to an abundant harvest from my generous mother’s garden, I was able to attempt my first Ratatouille and there was no better time to do so than during the ten-day “Cook for Julia” event for PBS. Here’s what I learned from making it. 1.) It’s labor intensive and takes a long time. 2.) I can spell it now. 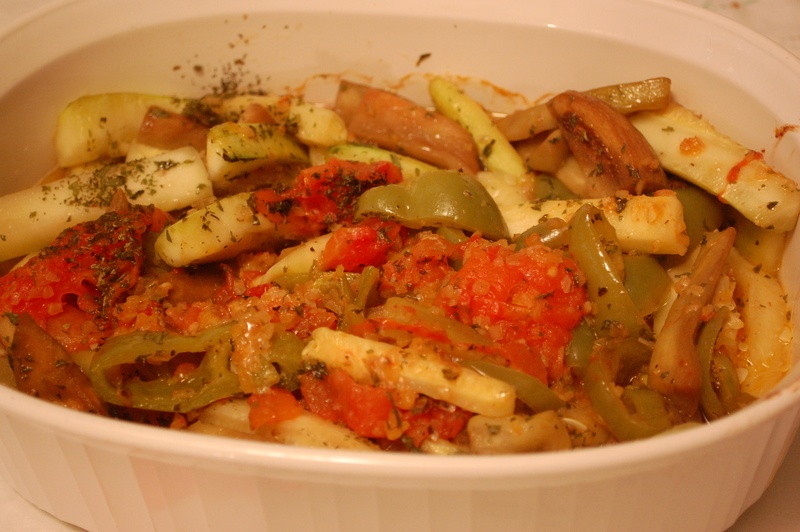 Place eggplant and zucchini in a large bowl. Toss with one teaspoon salt. Let stand for 30 minutes. At the end of the time, there will be some juice in the bottom of the bowl. Drain, and pat dry vegetables thoroughly with paper towels. Set aside. Fill a medium saucepan halfway with water and set to boil. 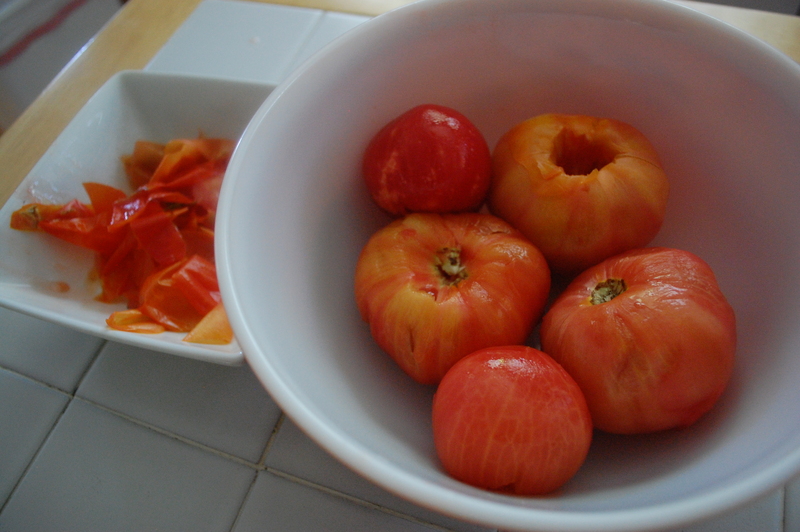 Drop tomatoes, one at a time, into the boiling water for 10 seconds each. Remove. Peel skins off tomatoes. 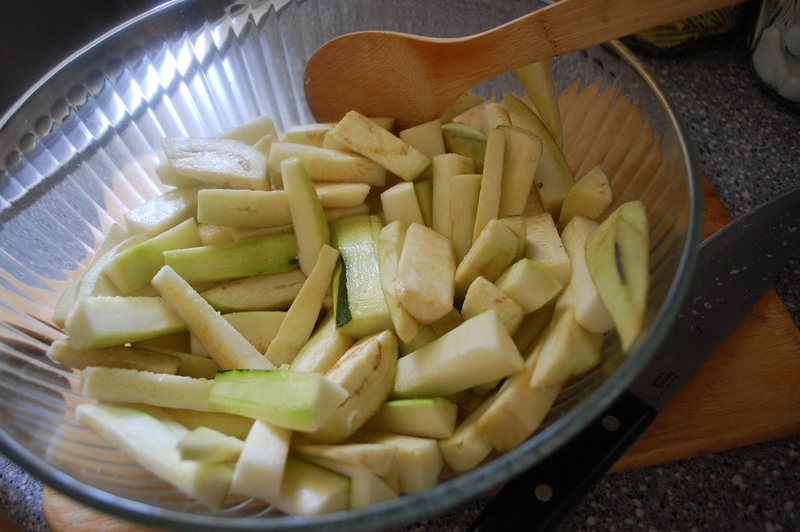 Slice them in half widthwise, and squeeze out juice and seeds over wastebasket. Set juiced tomatoes aside. Once the eggplant and zucchini are dried and ready, preheat your oven to 300 degrees. Meanwhile, heat olive oil over medium-high heat in deep-set pan to prevent oil splashing. 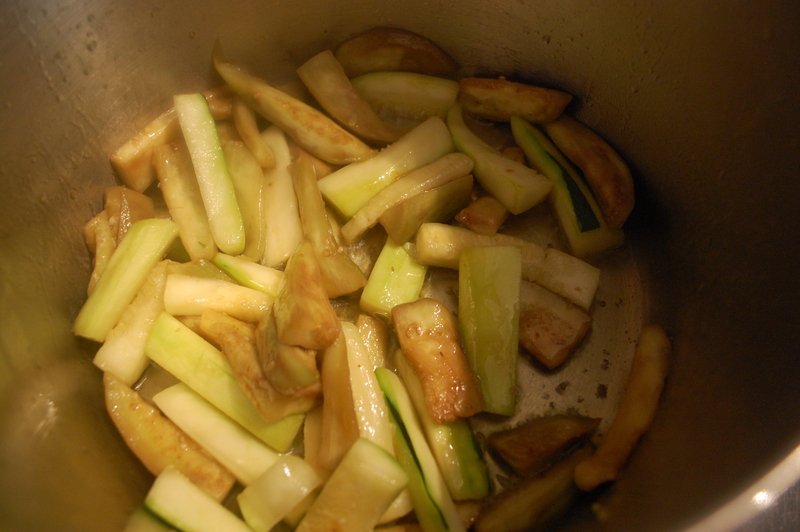 When it’s hot, sauté zucchini and eggplant in oil for about five minutes or until just lightly brown. Place just enough vegetables in pan to cover the bottom. Remove to side dish. Repeat until all zucchini and eggplant are cooked. Reduce heat to medium. In the same skillet, cook the onions and peppers slowly in olive oil for about 10 minutes, until they are tender but not browned. Stir in garlic and salt and pepper to taste. Slice the juiced tomato halves. Lay them over the peppers and onions. Season with salt and pepper. 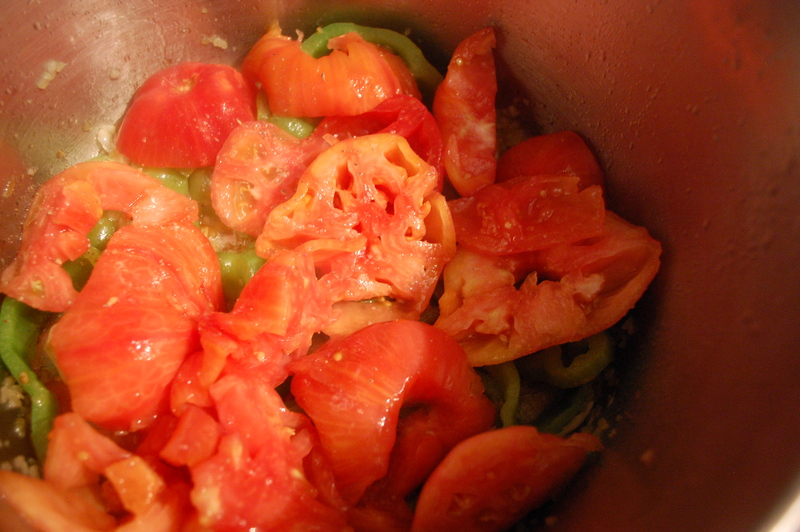 Cover the pan and cook over low heat for 5 minutes, or until tomatoes begin to render their juices. Uncover, baste the tomatoes with their juices, raise the heat and boil for several minutes until the juice nearly evaporates. 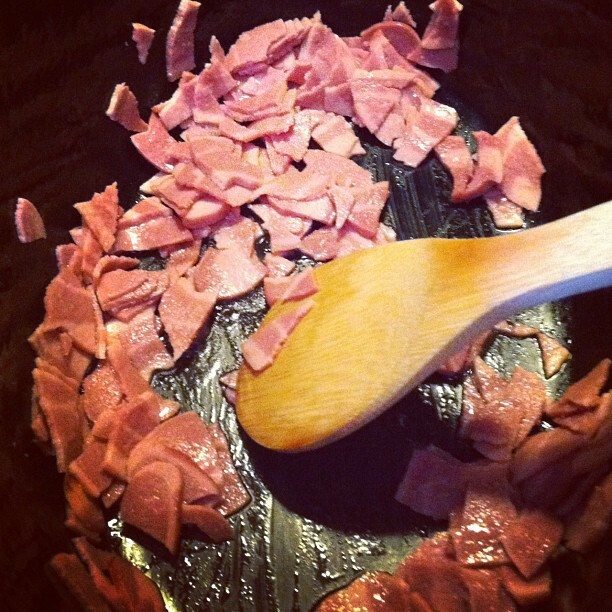 Grease a casserole dish. Layer one-third of the tomato mixture in the bottom and sprinkle with one tablespoon of the parsley. Arrange half the eggplant/zucchini mixture on top, then another third of the tomato mixture and another tablespoons of parsley. Finish with the rest of the eggplant/zucchini mixture and the rest of the tomato mixture and parsley. Cover and place in oven for 10 minutes. Raise the heat to 350 degrees. Uncover the veggies, gently stir, and cook for 15 minutes more. For more recipes from the Cooking for Julia event on PBS, click here! 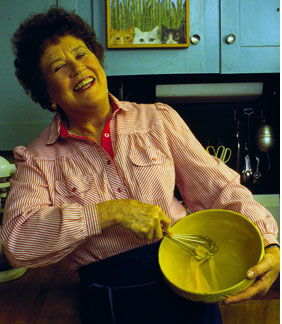 PBS is honoring what would have been Julia’s 100th birthday with a ten-day celebration of her food. They’ve asked their viewers to cook and photograph her dishes and share them online with other PBS viewers and food fanatics. You know I’m up for the task. I began with an easy recipe, one of the first I tackled when my copy of “Mastering the Art of French Cooking” arrived in the mail two years ago. It’s one of my girls’ favorites-in fact, my eldest daughter dislikes hamburgers-except those cooked Julia’s way. A little butter and cream (or a lot, in this instance) makes everything better. 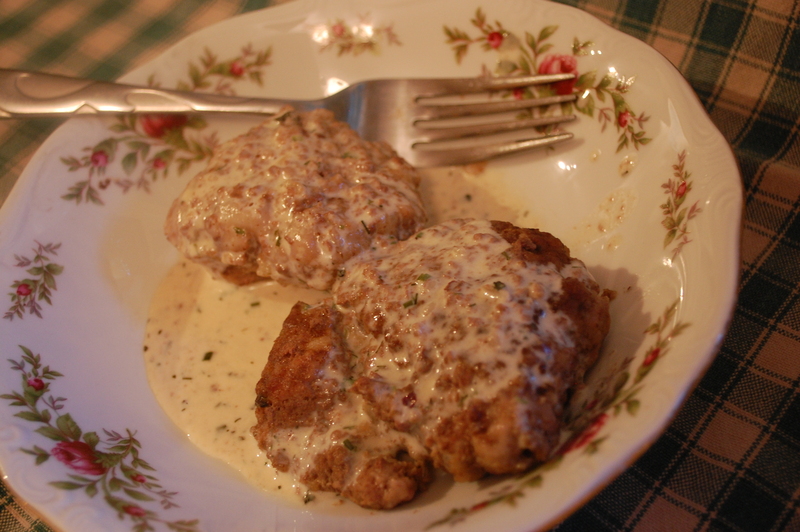 I also like this recipe because it’s relatively quick to make. I cannot say that about most of the other Julia creations I’ve tried! Cook the onions slowly in 2 tablespoons of butter for about 10 minutes until they are tender but not browned. Place in mixing bowl. 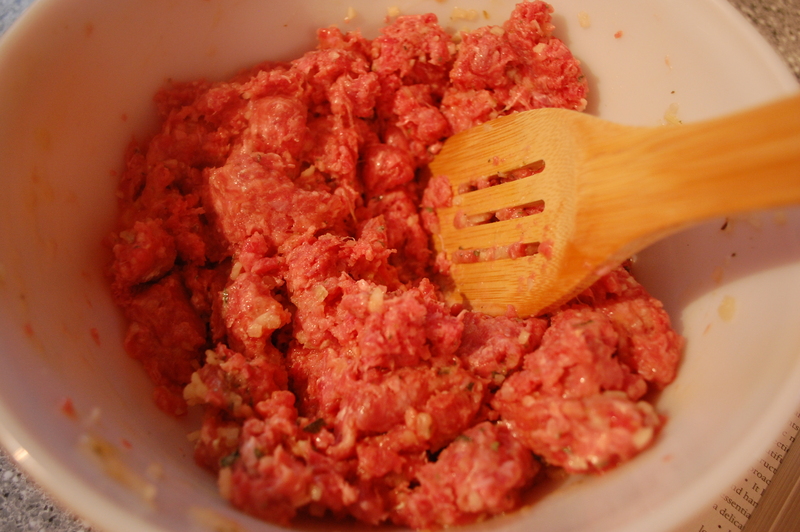 Add the beef, 2 more tablespoons of softened butter, and egg to onions and beat vigorously with a wooden spoon. Add salt, pepper, thyme. Form into patties (I made six). 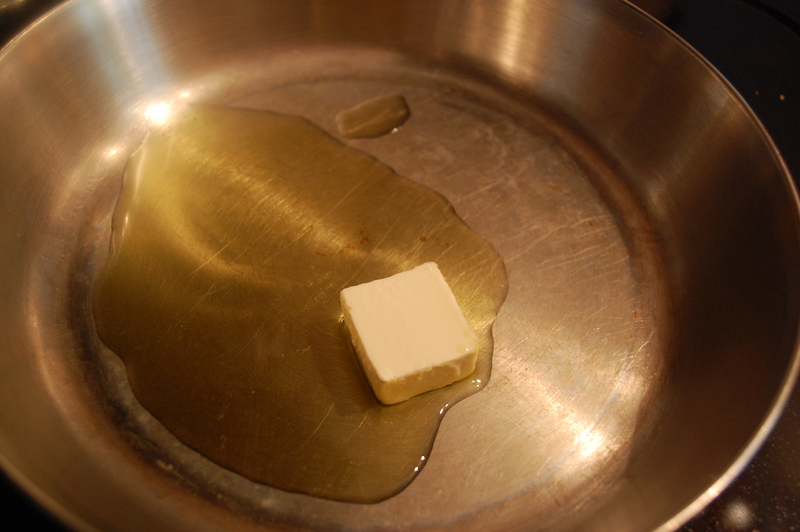 Heat 1 tablespoon butter and 1 tablespoon oil over medium heat. The butter will start to foam-when that subsides, roll each patty in the flour on the plate. 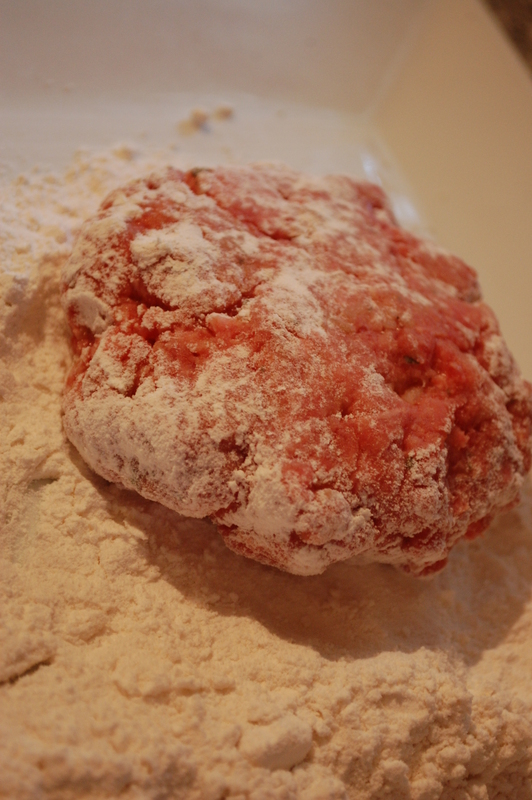 Shake off excess flour and sauté each patty until it reaches your desired level of doneness. (I did five minutes on each side). Arrange patties on platter and keep warm. Pour fat out of skillet. 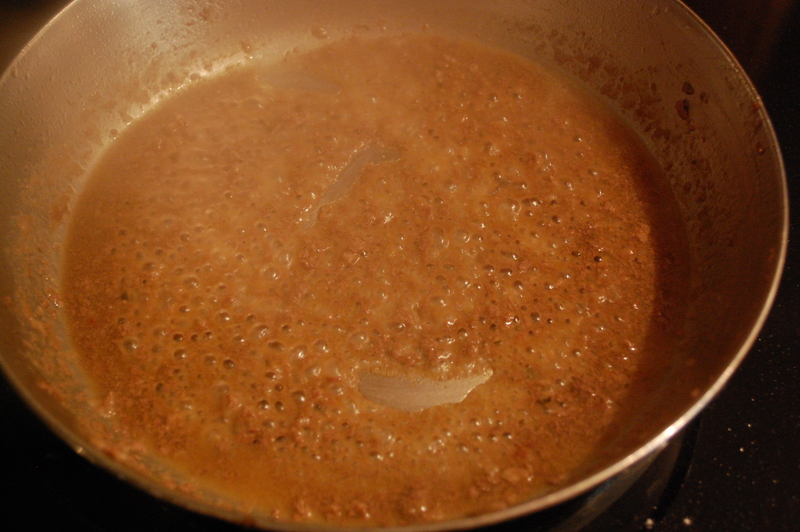 Add stock and boil down rapidly, scraping up coagulated cooking juices, until reduced to almost syrup (see photo below). 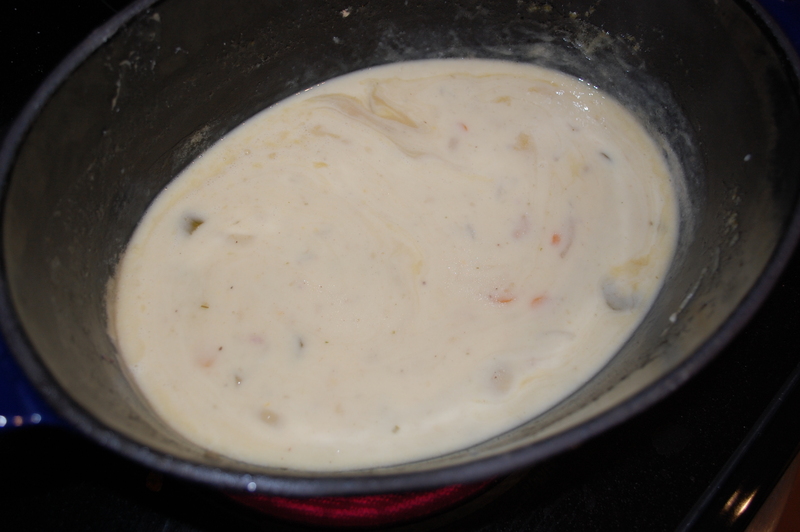 Pour in the cream and boil down rapidly for a minute or two until it has reduced and thickened slightly. Season to taste with salt, pepper, nutmeg and drops of lemon juice. Off heat, swirl in 2 more tablespoons butter by half tablespoons until it is absorbed. Add the Herbs de Provence and spoon sauce over hamburgers. Serve! 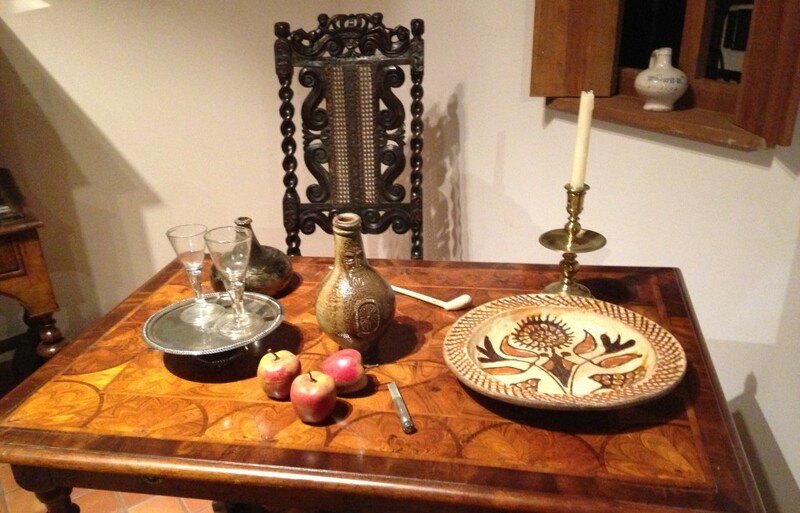 For more info or recipes from the Cook for Julia event, click here! I’m reposting this recipe as part of the wonderful PBS event happening right now! From August 5-15, PBS is celebrating the life and cuisine of Julia Child, who would have turned 100 years old this month! I’ll be adding more recipes to my Julia collection during that time and you can find out more about what PBS has planned by clicking here! Up until now, I’ve had this notion that for the purposes of this blog, I need to fix recipes which are 100 years old or older. But my favorite cookbook is only 51 years old. And I’m going to make an exception. 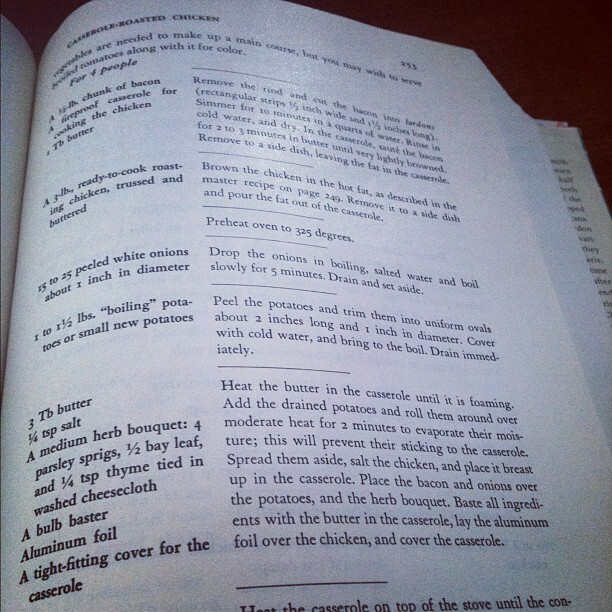 “Mastering the Art of French Cooking” by Julia Child, Simone Beck and Louisette Berthold, published in 1961, may not seem terribly historic, but you must remember that Julia and her friends were translating traditional French recipes-some of them likely 100 years old or older- for the modern world. So that counts, right? 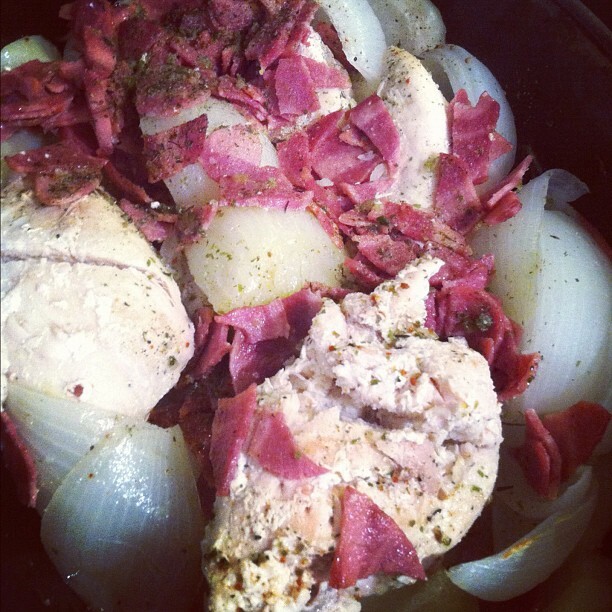 I was one of those women who watched “Julie and Julia” and fell in love with the notion of French cooking. I was one of those women who went directly from the TV to Amazon.com to order a copy of “Mastering the Art of French Cooking.” I was one of those women who waited expectantly for about a week, sighing with disappointment whenever the mailman passed by without delivering said cookbook. And I was one of those women who squealed with glee and took a photo of my treasure to post on Facebook as soon as it arrived. I am not one of those women who wants to cook every recipe in the book. I’ve spent much more time reading the cookbook than actually cooking from it. I love how it’s laid out-step-by-step with the corresponding ingredients. It’s written conversationally. I’m convinced that even a novice cook could tackle these recipes. They are time-consuming though-everything is homemade. There’s no microwaving and no shortcuts. And there are certain essentials you must stock before cooking like Julia…cream, butter, onions, wine (all kinds) and a Dutch oven that can also be used on the stove top. My mother gave me a Dutch oven this spring. It’s my favorite casserole dish and it allows me to do more of Julia’s recipes than before, including this one. I loved this dish because it’s all in one pot-and it’s a good one for company, because you throw everything in and then let it cook while you entertain. 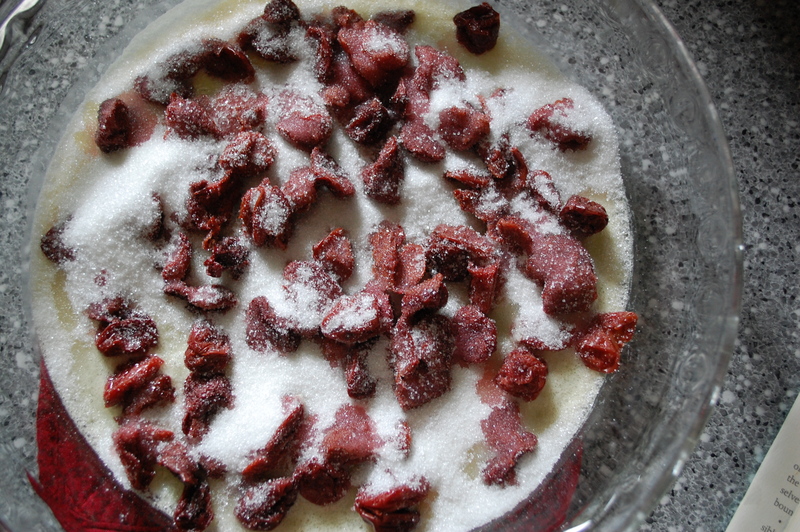 Fry the bacon in the Dutch oven until very lightly browned, about 2-3 minutes. Set bacon aside, leaving the droppings in the dish. Add 2 tablespoons of butter and the oil and heat. 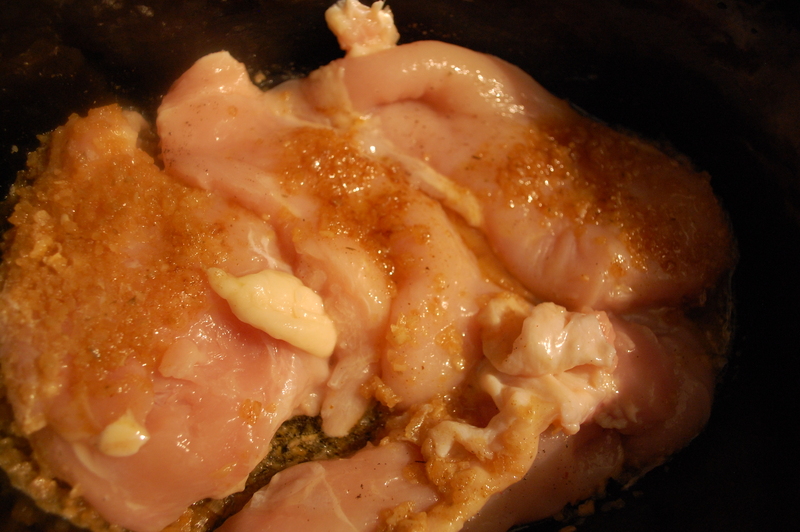 Brown the chicken in the bacon drippings, butter and oil, 2-3 minutes on each side, until just slightly brown. 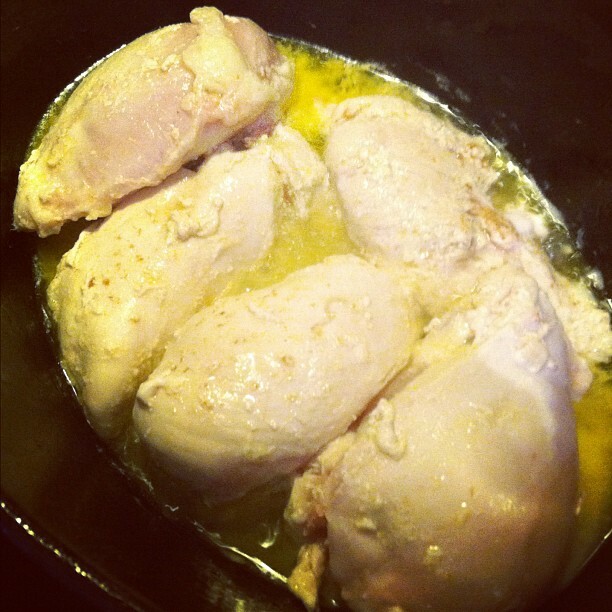 Set the chicken aside; pour out the fat and oil. Drop onions in boiling, salted water and boil slowly for five minutes. Drain and set aside. Peel and trim potatoes into uniform slices about an inch in diameter. Cover with cold water and bring to a boil, then drain immediately. You don’t want to overcook the potatoes. 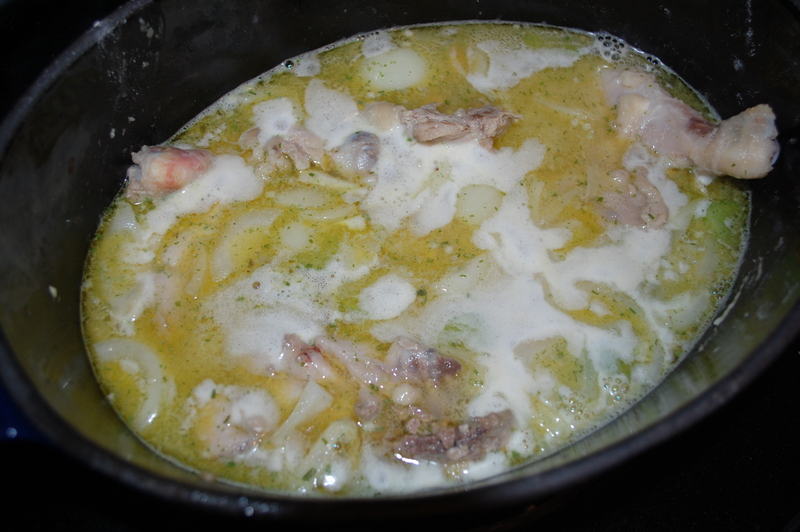 Heat the rest of the butter in the casserole on the stove until it is foaming. Add the drained potatoes and roll them around in the butter over moderate heat for 2 minutes to evaporate their moisture-it will keep them from sticking to the casserole. 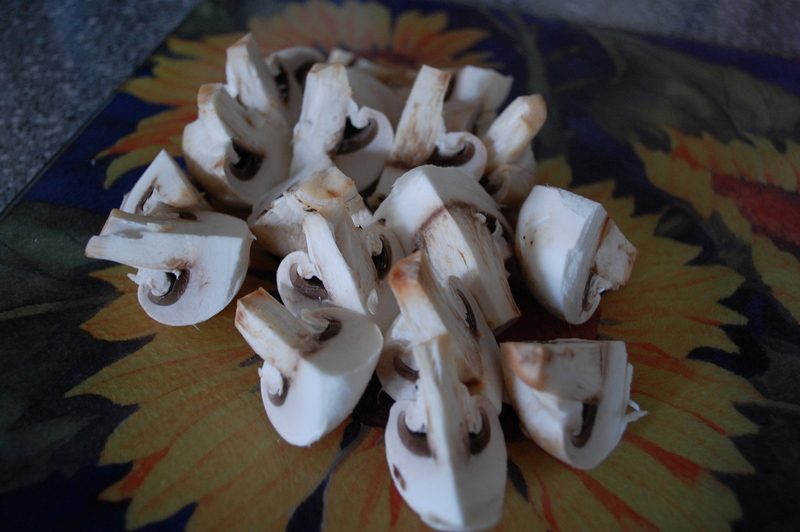 Spread them in a circle around the edge of the casserole. 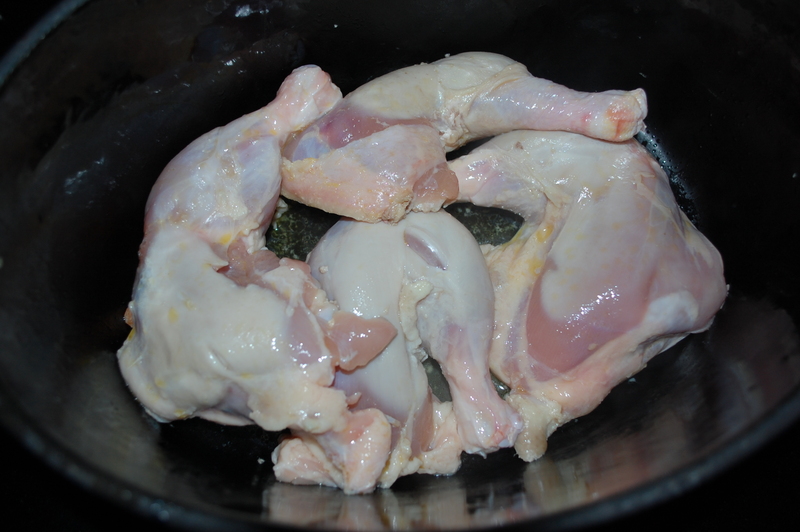 Salt the chicken and place inside the casserole. 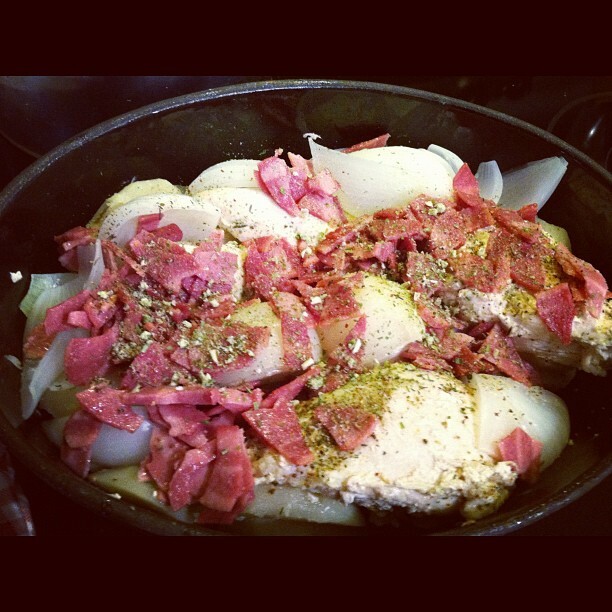 Place the bacon and onions over the potatoes, and sprinkle in whatever spices you wish. Cover the casserole and heat it on the stove until the contents are sizzling, then put it straight into the oven and roast until the chicken is no longer pink, about 30-45 minutes, basting once or twice with the butter and juices in the pan.